Our after school programs provide learning opportunities that support the cognitive, social, physical and emotional development of children and teenagers. These balance between academic work, arts and recreation with are all-important to children of such ages. Cognizant of the challenges school-aged children face due to malnutrition and the effects it has on their cognitive functioning, this program is designed to address micronutrient deficiencies in school-aged children in resource-poor communities and improve their cognitive development. was a vision of Edith Asange’s who worked as Director of Community Development and Events with CADAC (Community Awareness & Development Association –CADAC. A subsidiary of BFL that focuses on community awareness & development). It was officially started in September 2012 in two schools with over 120 pupils. 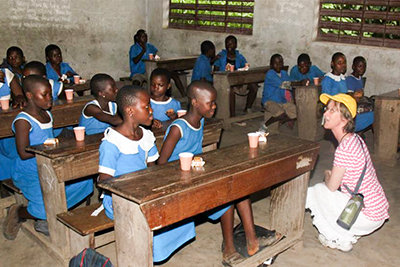 It was structured to provide learning opportunities that support the cognitive, social, spiritual and emotional needs of the most vulnerable children in our communities – especially those from government primary schools in Cameroon who were dyslexic, from poor families, or simply those whose families’ thought were “a hopeless case”. In working with these groups of children, we realized how difficult some of their lives were; having to live far from family and those they trust, taken to serve as domestic servants in the hope that their mistresses will educate them. Some went without food, without books, without shoes. Most of the students we worked with could barely read or write which explained why both their guardians and teachers had lost hope in them. They were often abused physically and emotionally. In working on her M.A in Peace, Development, and Conflict studies thesis Edith put together the perspectives of students and teachers on what safety means to them, what makes them unsafe and how we can create a safe environment in schools. 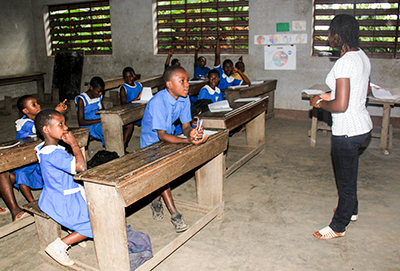 To do this, she organized a training workshop with over 52 head teachers and about 14 teachers in the South West Region exploring the need for a safe environment in their schools where both the needs of the student and teacher are met. It was through these workshops that teachers and head teachers were empowered with the tools they need to create safe learning environments in their schools where empathy thrives. This is an area that needs more work because it deals with a complete change in perspectives and some teachers just do not buy into it, instead, they believe that if a child is slow academically the whip will help them sit up. Our desire has always been to correct this mentality and we are pleased that the schools that host our ASP have learned from the way we treat the pupils. Very slowly these schools are becoming safe environments for their students. As we continue to expand, our hope is that we will affect positive change in all the schools that partner with us. The successes we have recorded since our creation are enormous. The first year all our students who could barely read or write recognizable words passed the Government Common Entrance Exams into secondary schools. We visited parents who were having second thoughts sending their children to secondary school and helped them see the importance of education. Over ten students who were due to quit school were encouraged to enroll for their entrance exams, which they all passed with flying colors. We continue to register huge successes with end of the year exams and working closely with parents and guardians to provide the best opportunities for their children. Children who were timid and would not talk in public began participating in class; answering questions and talking in front of the whole class. As our program expands so are the success stories.